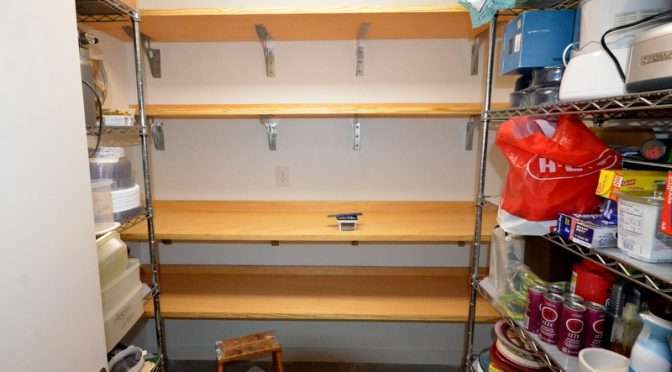 Steven tackled the pantry shelves project. Two sheets of 3/4-inch plywood from Home Depot, transported in the back of Andy’s truck. Andy lives next door. 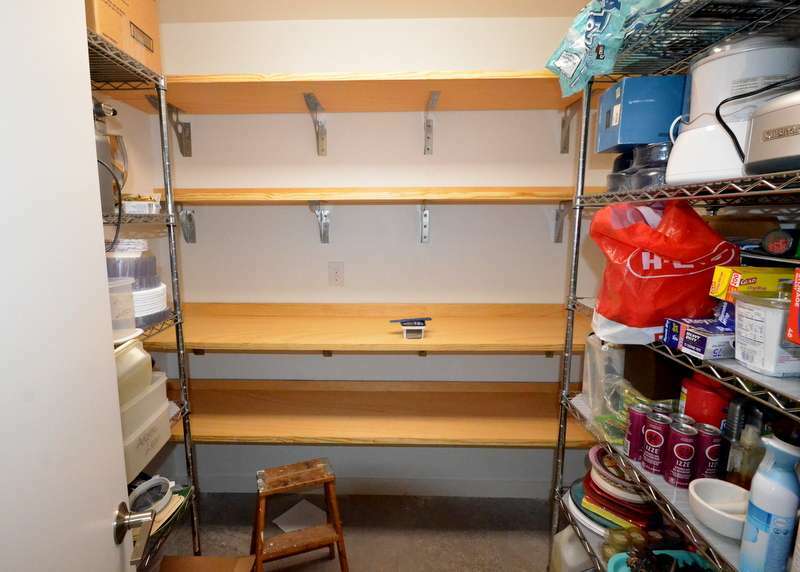 16 heavy-duty shelf brackets ordered online from Woodworker Express. Screws, drill and bits, Danish oil, stud sensor, level. With help from Jacquela cutting the plywood at the table saw. Six days, including 72 hours waiting for the Danish oil to dry sufficiently. 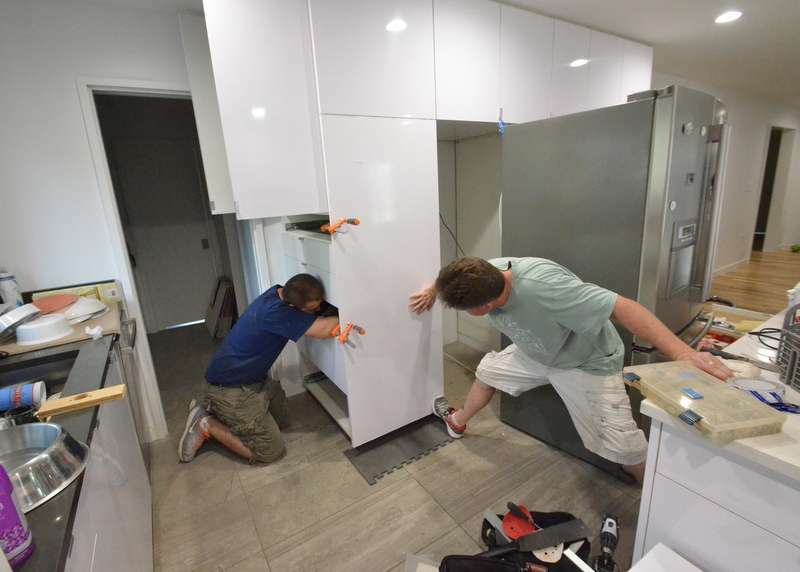 Bani, left, and Chris are back, continuing to work through the punch list for the kitchen cabinets. 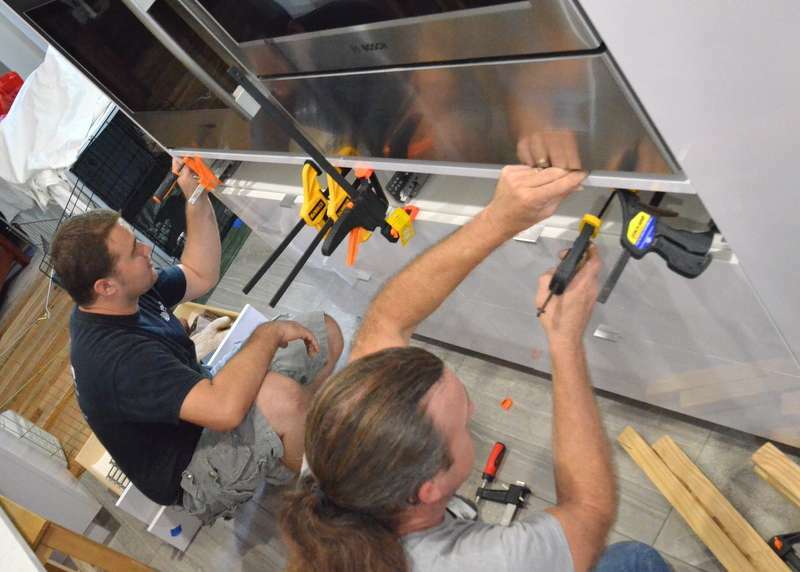 Above, they clamp a new piece of trim under the oven and microwave — one long piece to replace two shorter pieces that failed after the glue gave out. The utensil storage at the utility drawer between the sink and cooktop is now correctly cut, installed, and functional. Earlier, one of the four stainless steel bins did not fit correctly, due to a hole drilled 1/8 of an inch out of place. Bani and Chris unwrap a cabinet panel. It replaces a similar panel that was defective at manufacture. Chris screws the replacement panel into position. 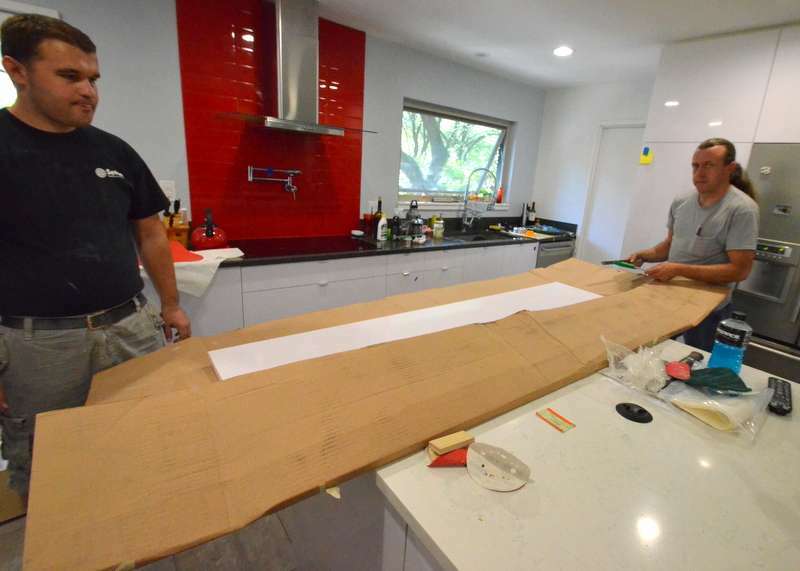 Last week, Ron and Odell from Ranserve walked the house with Steven to organize the punch list. Two days ago, Odell and Cris began adjusting pocket doors and experimenting with how to fill the holes around the balusters. 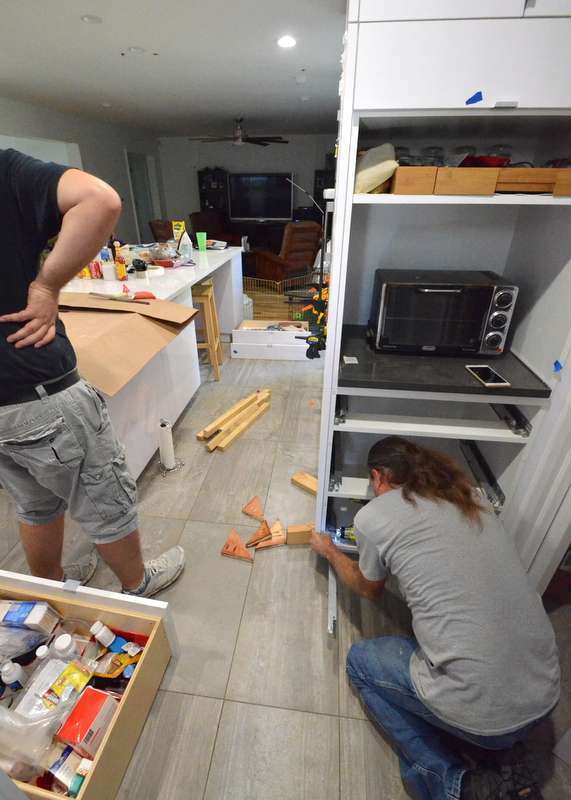 Today, Aaron arrived with Chris and Bani to begin working on the kitchen cabinets — smooth edges, filling holes, adjusting drawers and slides. Aaron remeasured for replacement panels. 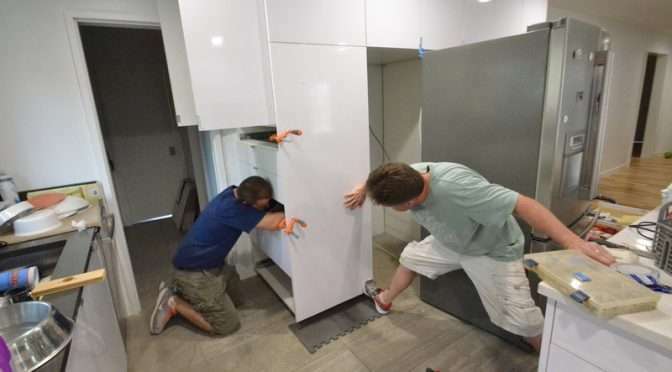 Above, Chris, left, and Bani, right, adjusting utility drawers between the cooktop and sink. 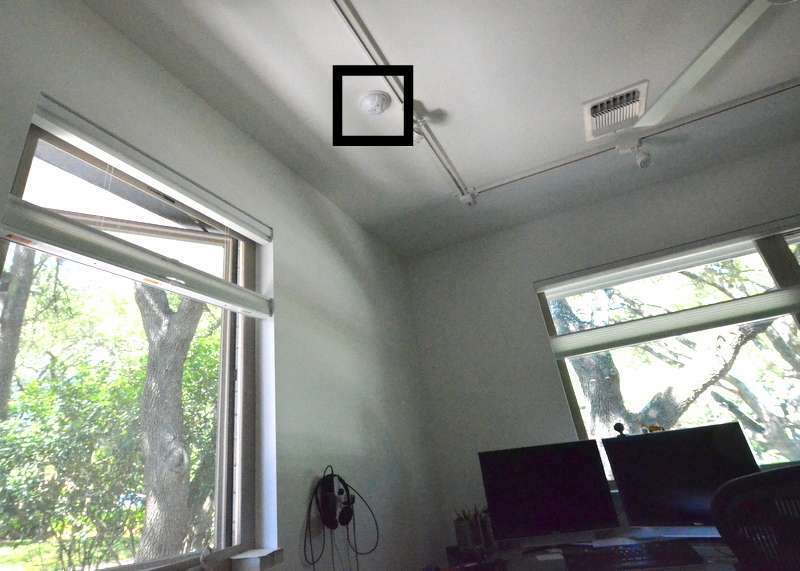 Chris arrived from Granite Security to install the glass break sensor missing from the ceiling in Steven’s office — outlined in the black box in photo above. Chris also added “water bugs” at the washer and both tankless water heaters — sensors that alert us if the washer and heaters overflow. 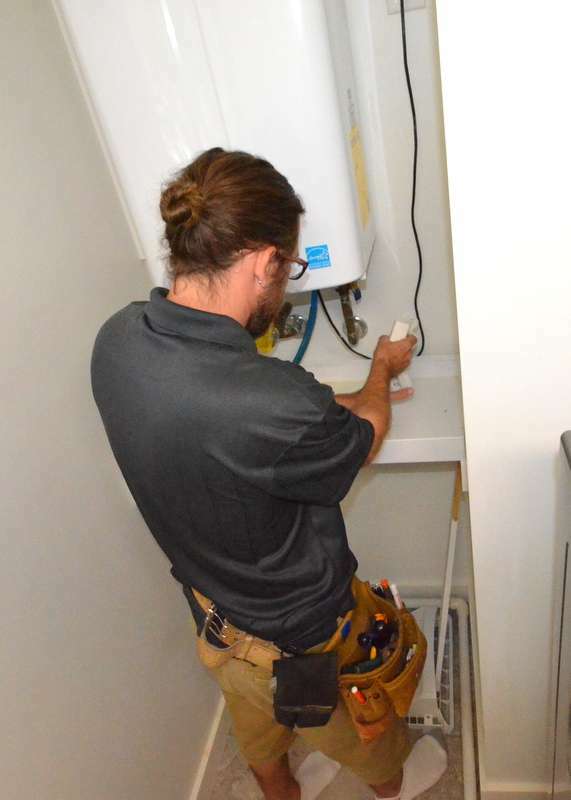 Chris positioning the water bug at the upstairs tankless water heater. We designed one run of cabinets in the kitchen to end with a shelf for the dog bowls. This was intended for Reboot. She never got to use it. Adobe is now 25 pounds and tall enough to reach. 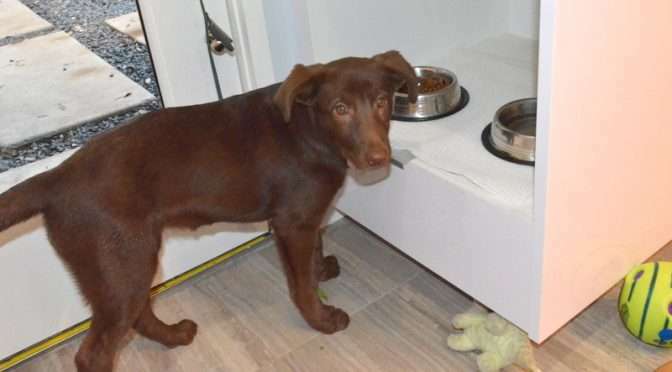 The water and food bowls come up off the floor. She took to it instantly. Thomas arrives from C&W Appliance Service to finish repair of the Wolf induction cooktop. Step 2 — today. 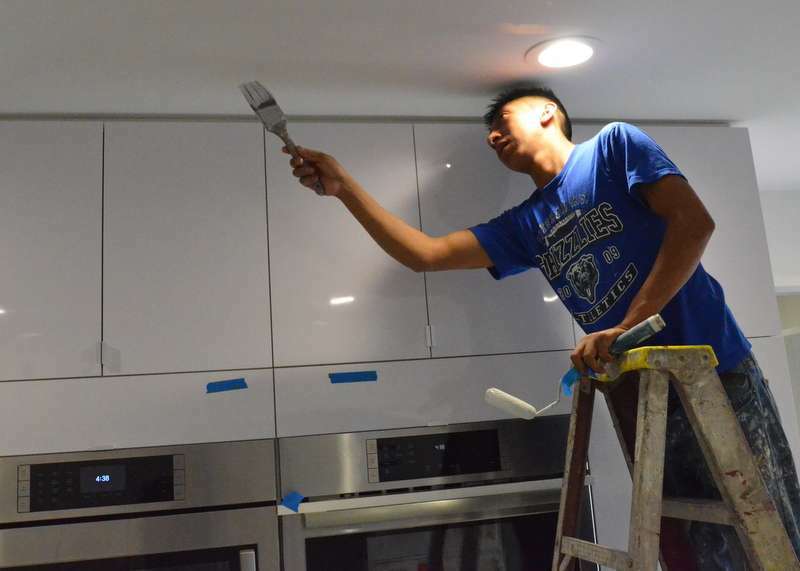 Thomas begins by lifting the cooktop out of the counter, then uses a knife and razor blade to remove what remains of the gasket from the top of the counter and underside of the cooktop. Steven stepped in after with paper towels and Goof Off to remove traces of the gunk left behind. 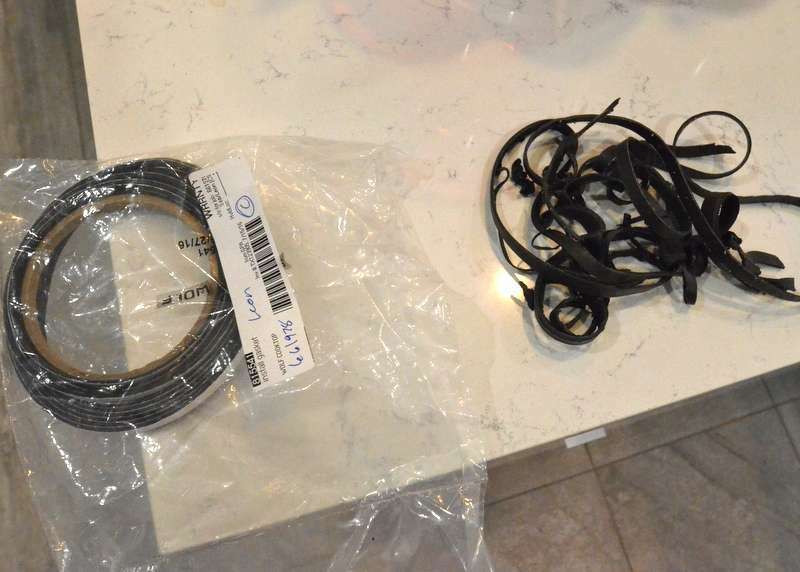 The new gasket rolled up neatly in the plastic bag, and the entrails of the old gasket to the right. Thomas peels and sticks the new gasket to the underside of the cooktop. 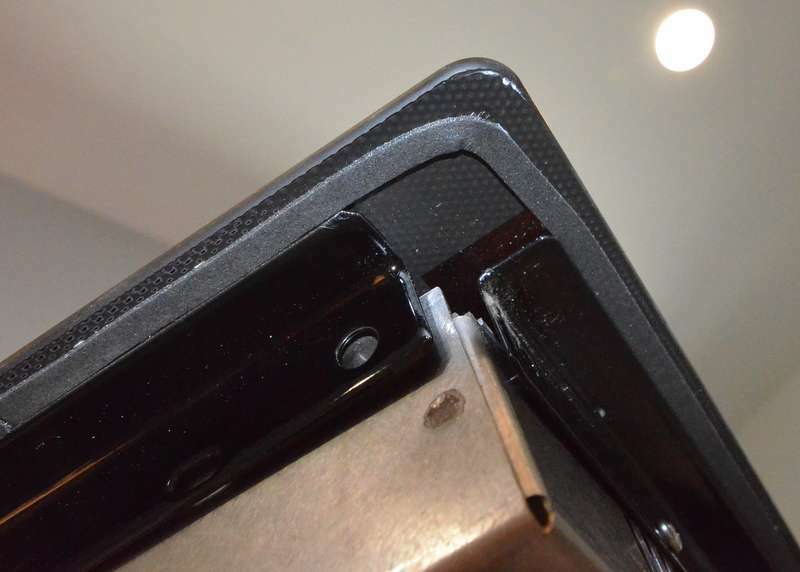 A close up of the new gasket applied to the underside of the cooktop. 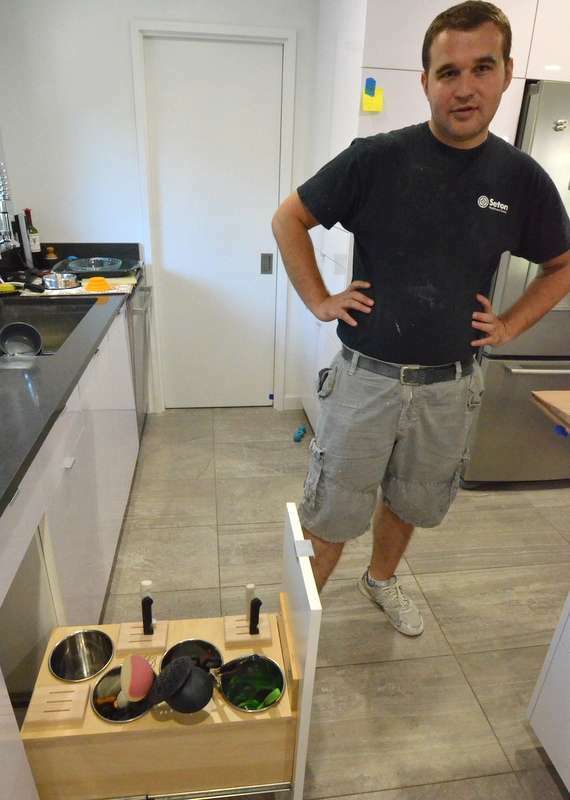 Thomas lowers the cooktop back into position in the countertop. Check off that box on the punch list. 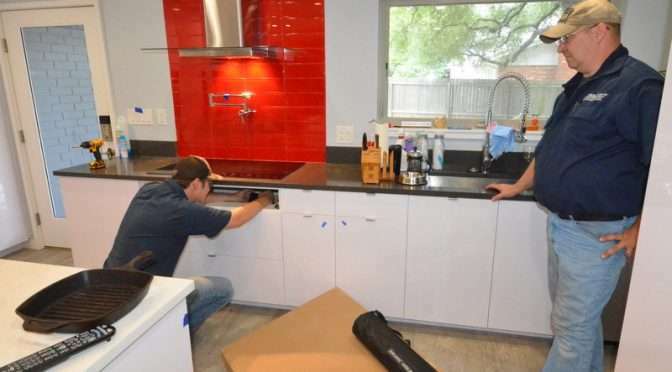 Chris, left, above, and Richard arrived today to replace the glass top of the Wolf induction cooktop. Why? The glass sometimes displays a fractalizing crack that travels from element to element. It appears. It disappears. We reported this 26 June to Ranserve and to Kristin at Harway. The cooktop is covered under warranty. Harway set up a factory repair. 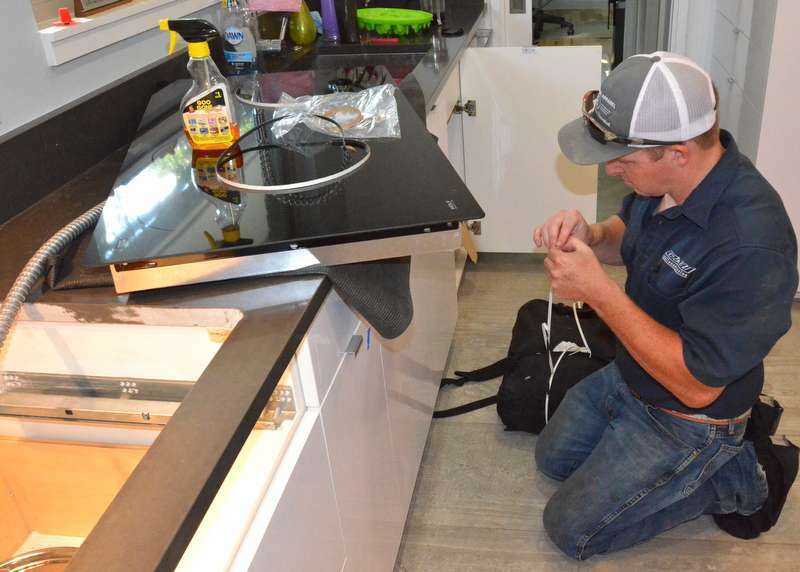 To remove the cooktop, Chris and Richard used a knife to slice apart the rubber gasket that goes between the underside of the glass and the quartz countertop. 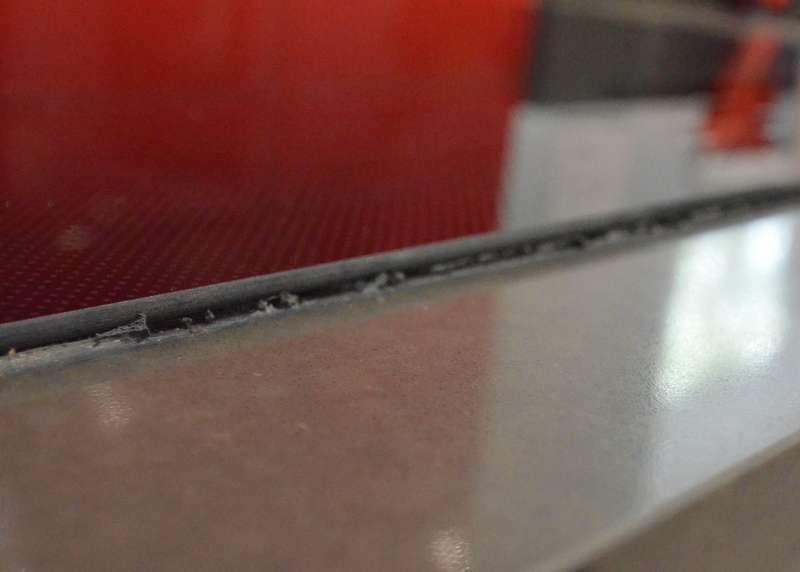 This gasket apparently compresses over time and begins to resemble silicon sealant. In the process of slicing apart the seal, several sections of the original gasket were peeled and sliced away, leaving a ragged gasket behind. 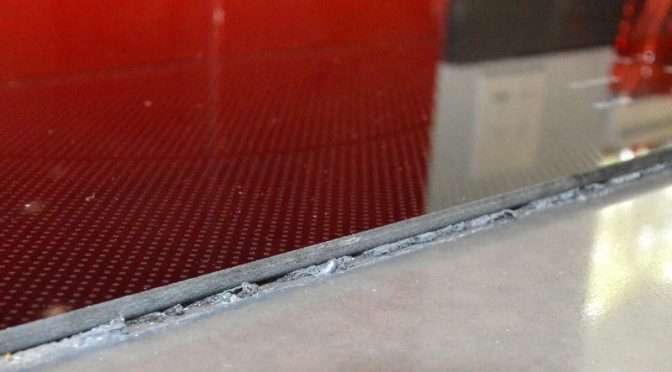 The ragged edge of the gasket after it was sliced apart and the replacement glass cooktop installed. Shredded rubber is clearly visible and sloppy. Wolf supplied the replacement glass — but not a replacement gasket. “Sometimes they do, sometimes they don’t,” Chris said. They will need to obtain a replacement gasket. Chris said he would order this and schedule a second service call when it comes in. 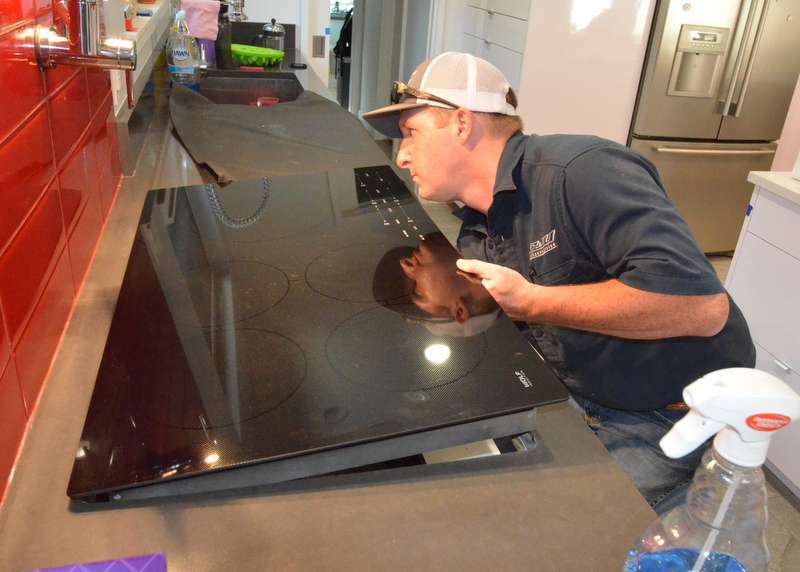 Steven is surprised that a replacement gasket was not shipped automatically with the replacement glass cooktop. Jacquela is standing at the Bosch Benchmark oven in the kitchen, angry, short-tempered, pushing buttons on the keypad. The oven responds with unhappy beeps and refuses to comply with commands. Steven goes upstairs to the electrical panel and flips to the off position the breaker that the electricians labeled for the oven. The oven still has power. The control panel is still lit up. The light inside the oven still switches on when you open the door. Steven calls Kristin at Harway. 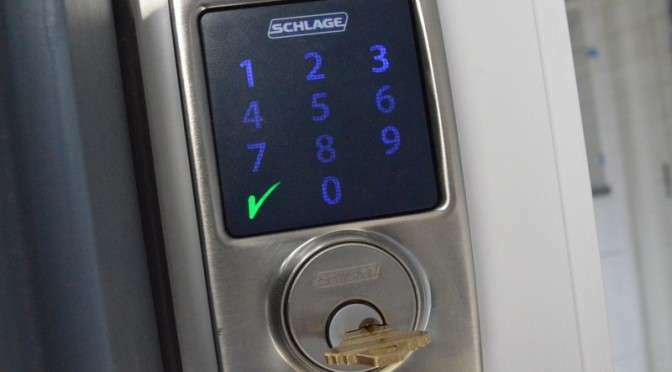 She will contact her office in the morning to arrange for a service call. Steven calls Mark at Ranserve to alert him there is an electrical problem — “the breaker to the oven is not functioning.” Mark contacts Capstone Electric. Scott Breen calls Steven to ask for details. Steven sends pix. Scott arranges to dispatch Steve the electrician. Steven speaks with Karen at K&N, the service company authorized by Harway and Bosch. A tech is scheduled for 5 July. 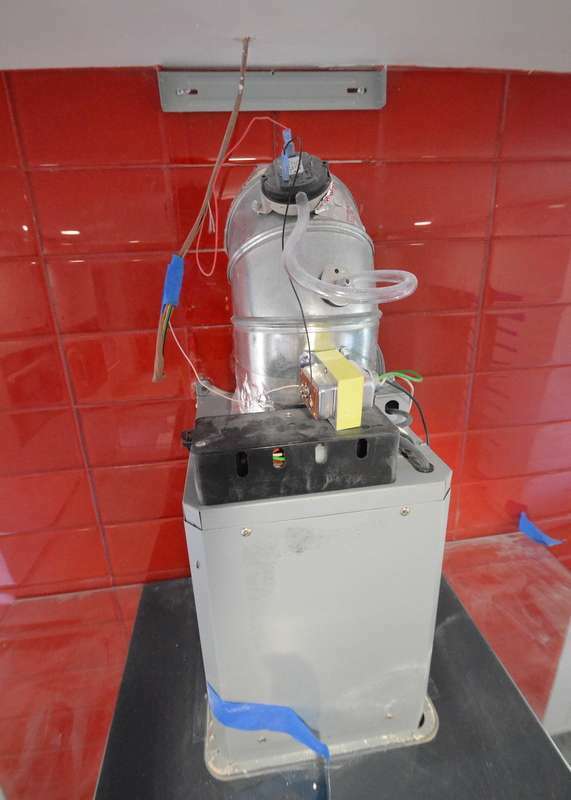 Austin Air connected the component devices for the make-up air system to the exhaust hood in the kitchen. Odell reports the electricians will connect all this to power sometime Thursday. 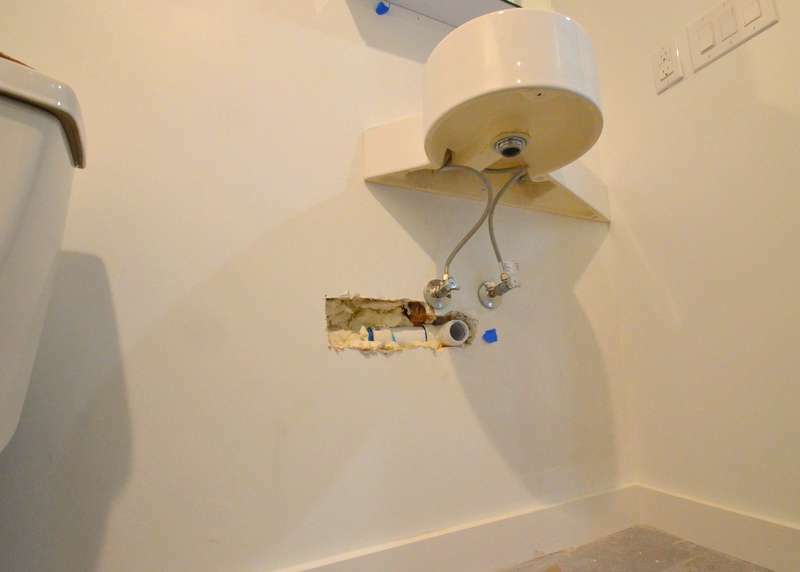 In the mudroom, yesterday, Odell opened up the wall and relocated the drain line into proper position, directly underneath where the drain will mount in the sink.